Marine biologists from Aberystwyth University have tagged two giant leatherback turtles in the Caribbean as part of an international study. The team visited the Commonwealth of Dominica, where they have used satellite tags to find out how female turtles choose a beach to lay eggs. Leatherbacks, the largest turtle species, are classed as endangered. John Fish and Rowan Byrne led a team from the university's institute of biological sciences. They were able to proceed with the tagging after meeting the island's prime minister, Roosavelt Skerrit. 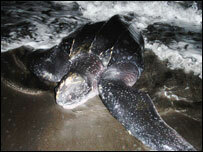 "This is the first time that nesting leatherbacks have been satellite tracked off Dominica," said Dr Fish. "Satellite relay data loggers were attached to two turtles, named Doris and Mabel. "Directly attached to the hard outer shell, the data loggers will record their every movement for the next nine to 12 months before being naturally discarded as their shells expand, causing the attachments to give away." In the short time since the turtles were tagged, Doris has stayed close to Dominica but Mabel has travelled 46 miles (75km) and dived to depths of 420m. They will attempt to nest every three years between March and August at 10-day intervals. During this period they will lay between 70 to 100 eggs. The experts will analyse the turtles' behaviour, where they lay their eggs, where they travel and the distances they cover. 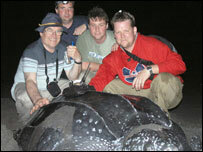 A research team at Swansea University used satellite tags to track Leatherback turtles' movement and behaviour last year.